Description: Cambrooke's exclusive low protein imitation "Sticky Rice". Perfect for "Maki" sushi, and stir fry dishes. Preparation: Bring 1 quart of water to a boil. Add 1/3 cup of rice and simmer on low heat uncovered, stirring gently for 10-12 minutes, until tender. Water will thicken. Drain and rinse very well (1 minute) with warm water. Serving Suggestions: Use in place of any vegetarian rice dish. Storage: Store in a cool dry place. Resealable zipper pack keeps dry product fresh. Ingredients: Cornstarch, wheat starch, white rice flour. Contains wheat. 1/29/2015 – Does this cook up similar to long grain white rice? Does it taste and have a consistency similar to long grain white rice? . 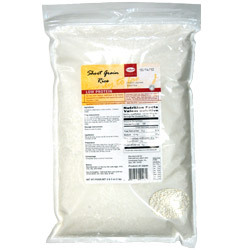 . .
7/10/2009 – Under nutrition facts, is the weight considered the weight of the raw rice? Or is the weight based on cooked rice? 4/27/2007 – Is there another way to cook this rice so that it comes out more like sticky rice for, perhaps, sushi?